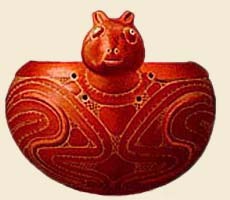 Ceramics show the creativity of ancient peoples and the workings of society. Look closely to see the maker's mark on this pipe. Contrary to what you might think, archeologists spend most of their time in artifact labs, not excavating . The lab is where archeologists get a close look at the finds from an excavation. 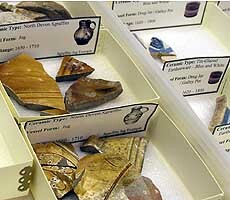 Archeological collections are like a library full of objects. They can help you research lots of questions, such as: What did families do for fun before television was invented? Who lived in your state before you? Where did kids hang out? If you buried your kitchen garbage today, what would last a year? 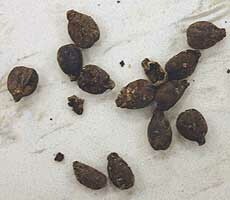 Seeds suggest what foods people ate and might be found with bones or pollen. 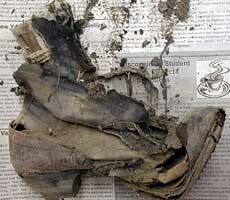 Leather falls apart under wet conditions, like in a garbage dump or a privy. Excavators take soil samples from each layer to analyze in the lab. 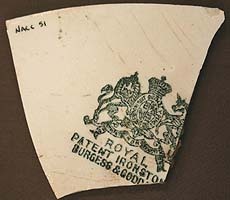 Broken, chipped, but sometimes whole -- artifacts come in many forms. 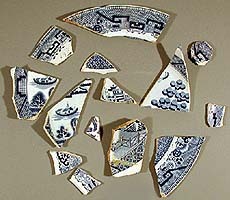 Excavators often find artifacts of pottery, glass, or stone, which last longer in the ground than food or leather. 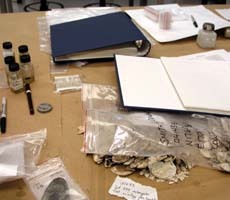 Durable materials and even dirt samples tend to be a big part of an artifact collection because they are better preserved over time. In the lab, archeologists look at how often and where they found different types of artifacts. This information helps them understand what people did at a place and suggests what their activities meant to them. Scrub the artifacts to be the first to really see them since they were dumped. 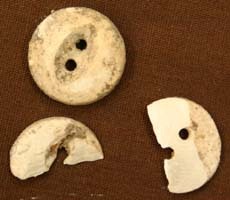 It's ok to leave bone artifacts, like these buttons, a little dirty. Washing removes gunk. 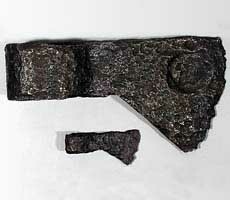 Most artifacts are brushed clean with a toothbrush and water, then left to dry. Water harms organic and metal artifacts, so they need special treatment. Critters, bugs, and fungi-- these are the enemies of archeology conservators. Debugging and washing artifacts are the first steps to process a collection. The tools of the cataloging trade. Numbers are painted using clear polish, ink, a tiny brush, and a lot of patience. Special baggies keep the artifacts safe and organized. 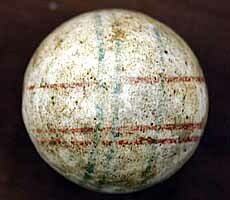 Cataloging identifies the artifacts and makes a record of them. To do the job well, archeologists need to know when and how things were made, and their names, styles, and uses. Each artifact gets a number coded with where archeologists found it. Artifacts go into archival plastic baggies. They are arranged in archival boxes by the unit and layer. Archival packaging helps preserve the artifacts. You might recognize conservators' tools from science class. Nautical hardware lost at sea is found again through conservation. 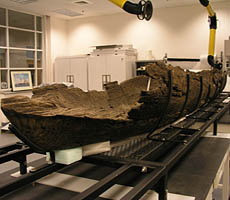 Conservation suggests that enslaved African Americans used nails to hold this wooden canoe together. Conservators use chemistry and other sciences to figure out how best to preserve collections so they won't corrode and disintegrate away. 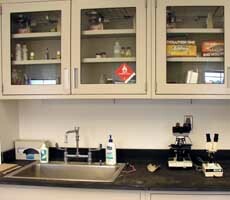 The conservation lab is where they take special care of fragile materials, like corroding hardware found in bays or boats from river bottoms. 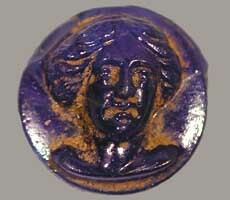 Once an archeological site is excavated, the collections are the irreplaceable evidence of the research. They also unique snapshots of past life. 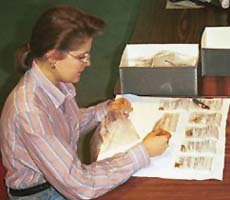 Protecting archeological collections from bugs, animals, and decay ensures that they will be useful for a long time. 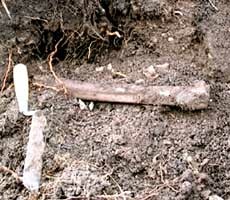 Archeology has uncovered lots of history at Fort Vancouver NM. 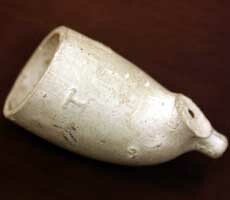 Archeologists think kids drank water from jugs like this. 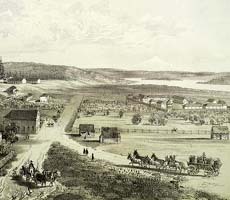 Fort Vancouver provided people in the West with everything they needed. 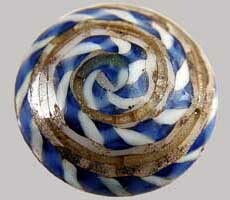 An unusual glass button was lost at Fort Vancouver. Token pieces like this one can get lost in the shuffle. 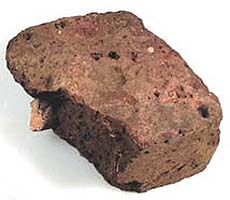 Archeologists find durable artifacts from buildings, like brick, more than wood. 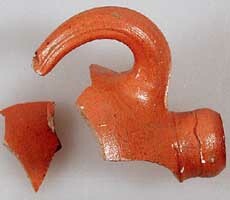 Maybe a kid used this toy axe to help an adult. 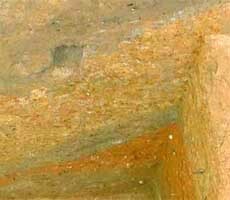 To interpret a site, archeologists look again at their research and examine their excavation finds and notes. The collections show how people in the past spent their time. We can imagine them quenching thirst or eating at a party. We see that they, too, lost fancy buttons and see the small things in their pockets. Collections show us what people built with, and played with, but a lot of the total picture goes missing. Visit archeology at a museum or park near you! Want to know where bison roamed? Look for collections from the American West. What did kids play with? Look for help at local museums and historical societies. How did ancient people build neighborhoods? 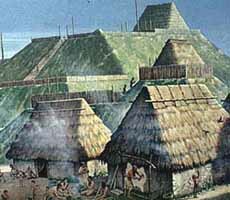 Find out what ancient Mississippian architects did. 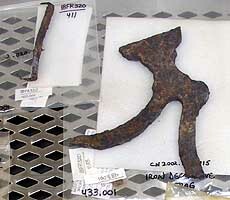 What happens next to an archeological collection? 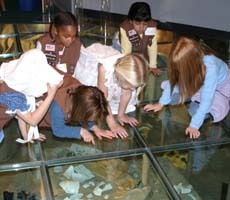 Museums make exhibits, programs for kids, and help researchers to use them. Archeologists use the sorted-out artifacts to write their excavation reports. They also enter everything into a computer database. Even after a collection is put away, its work isn't done. In fact, the next person to use it might be you! 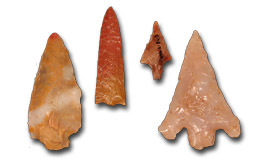 Use collections to learn about the environment, people, and places who lived before us.